Norwegian based OLEX AS, the manufacturer of complete systems for navigation, plotting and 3D seafloor mapping, is pleased to announce that OLEX 11.6 is now released and available as a free download or through your local Olex dealer for an upgrade of your system. OLEX 11.6 is optimized for the newest distributions of Scientific Linux (SL) 7.6 and 6.10 which are a free and open source operating systems supported by a cooperative of science labs and universities. Plus various other improvements and bug fixes are also included, like SIMRAD sounder connections coupled with GRIB, etc. The most important change of this latest release is the use of a new BIOS based id/nokkel format which supports storage like NVMe and the newest CPUs. NVMe is an open spec logical device interface used for accessing non-volatile storage media attached via a PCI Express (PCIe) bus. It has been designed to allow the processing hardware and software to fully exploit the internal parallelism and low latency available in modern SSDs. As a result, NVMe reduces throughput overheads and brings various performance improvements relative to previous types of interfaces which were designed within the parameters of older RAM speed and disc rotation restrictions in mind. Moreover, all new OLEX systems will now make use of BIOS hints for authentication, instead of hard-disk fingerprints. This means one can now replace a defective hard-drive and reuse the old id/nokkel. At the same time, a new id/nokkel will be needed if central components like the motherboard are swapped. We feel this is more pragmatic: hard-disks break more often than motherboards. Older systems are of course supported as always. 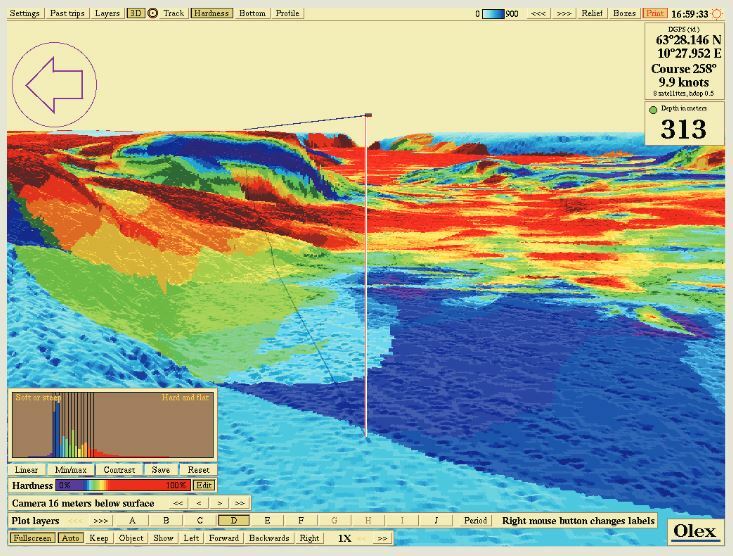 After years of research, development, and testing, OLEX AS has developed and keeps refining the most comprehensive seafloor topography mapping system available on the market. OLEX systems are based on Linux, and are considered to be the most stable systems of their kind available on the commercial market. Speed, flexibility, and user-friendliness are important keywords to explain their success. OLEX can use official and unofficial vector charts, in S57, shape and SOSI format, from Hydrographic Offices and commercial vendors. The navigation charts are displayed alongside the collected seabed data and the chart visualization software will always strive to achieve a clear and informative chart image and prevent the screen from filling up with unnecessary information, by displaying only information relevant to the current zoom scale. Zooming and chart display are fast, easy and seamless.